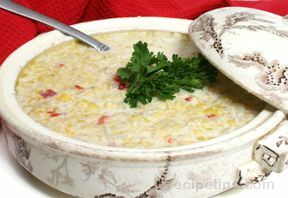 A great corn chowder with green chili and chicken added. Precook: chicken breast and 2 cups diced potatoes. 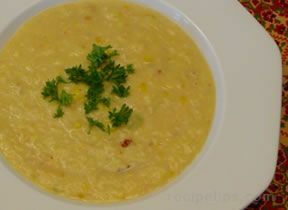 Add green chili, cooked chicken, cooked potatoes, cream of chicken soup, corn, onion, garlic, and salt to taste. Simmer on medium heat for 20 minutes. Let stand for 5 minutes before serving.